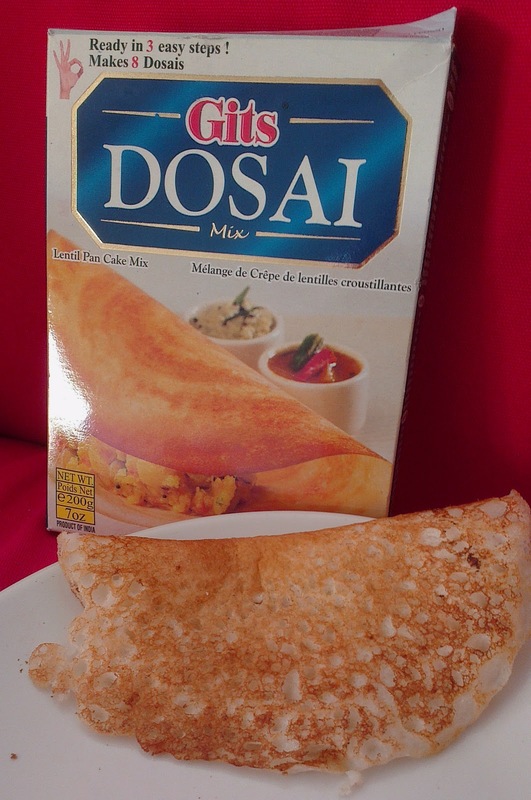 My Indian aunt was over last week and I asked her how you make dosa, a savoury pancake from south India. "Oh, it's very easy," she said. "Start by soaking rice and lentils overnight, then grind them in a wet grinder - you do have a wet grinder, don't you? - for 15 minutes, two tablespoons at a time..." Then there were other words, like "fermentation" and "leave overnight in a low oven", and I nodded and smiled and realised the chances of me making them were precisely zero. I'll happily put the effort in for a good dinner, but 36 hours of prep for pancakes? Not a chance. So I turned to my old favourite: Gits instant mixes. Yes, Gits. I don't know why they're named after a mild swear word, but it's worth getting over your embarrassment at the checkout and picking up a few boxes. Gits produce a phenomenal range of packet mixes for Indian food, from dosa to idli (steamed rice cakes) to vadai (savoury doughnuts) to dessert mixes like rasmalai and gulab jamun. The instructions are invariably: add water, cook, serve. Get over any snobbery or distrust about packet food, because Gits are seriously good. Anything that can reduce the laborious process of creating many Indian dishes is worth a punt, especially when each packet is about £1. You used to only find them in Indian corner shops but lots of supermarkets stock them in their World Foods range now. Some mixes are awesome, others less so, so I'm going to tell you about my favourite and my one to avoid. The pic at the top shows off my dosa skills. Add water, set aside for five minutes, then add a ladleful to the centre of a hot pan and spread the batter outwards in a circular motion. Fry until it's lacy and golden brown, then serve. Don't flip it, the other side should be soft and fluffy. Stuff your dosa with spicy potatoes and carrots, and add some fresh coriander to the packet mix to make it zingier. Sambar, a spicy lentil soup, goes with most Indian dishes including dosa. It's like a delicious, filling sauce for your dinner. Sadly, Gits's sambar mix uses a ridiculous amount of salt. Sort it out, Gits! You've turned something delicious into something saltier than the Dead Sea. Thankfully, it's easy to make yourself. Make a simple dhal by soaking and then boiling 200g red lentils with turmeric until soft and mushy, then add seasoning. Heat a little oil in a frying pan, then add 1 tsp mustard seeds and fry til they pop. Add some cumin seeds, chilli powder and curry leaves and stir. Add a large tomato, cubed, half a chopped onion, another vegetable of your choice (if you fancy), 150ml water and 1 tsp tamarind paste. Boil til the vegetables are tender, then tip the whole lot into the dhal and simmer for 10 minutes. Sambar should be thin, so add water if necessary to bring it down, stir in some chopped coriander, and serve it alongside just about anything. 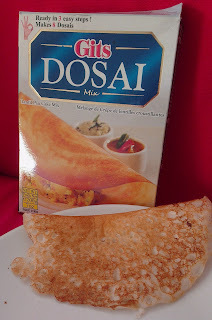 Thanks so much for this review - I have sniggered at the name many's the time at my corner shop but I will give the dosa mix a try as dosa is one of the tastiest foods ever! Oh, do - it's so easy! I ate mine plain, straight from the pan, and they were delicious. I got mine in Sainsbury's but most supermarkets seem to stock them now. Or try your local corner shop. SO GOOD.